Do many of our big-city mayors and police chiefs believe American citizens living in a democracy should have fewer rights than protesters in foreign lands do when they take to the streets to challenge their undemocratically-chosen governments? Do they believe that citizens living in this country with a Bill of Rights should be able to engage in continuing political protests, the same as citizens in non-democratic countries with no First Amendment guarantees? Do they believe that mere city ordinances, such as curfews and bans on sleeping in parks, should trump the U.S. Constitution? Do they believe that our Constitutionally-guaranteed rights of free speech, free assembly and to peaceably petition the government stop when the sun goes down and the curfew and no-camping rules kick in? Would those mayors and police chiefs, who are carrying out eviction raids on protesters in various cities around the country, enlighten us, pray tell, as to how protesters can mount a continuing, effective protest – a la Tahrir Square in Egypt – if police regularly evict them from public parks and plazas? Do they think protesters here should be regarded as potential terrorists and criminals to be surrounded with police, as in Zuccotti Park in New York, rather than treated as citizens exercising their rights as a free people? And New York Mayor Michael Bloomberg, do you really believe, as you have said, that there should be a “balance” between the right of people to assemble, protest and peaceably petition their government – and a supposed right of other people not to have a vigorous protest in the Wall Street neighborhood? Are you really on the right side of history when you comment that “the Constitution doesn’t protect tents. It protects speech and assembly”? Last time I read the document, I saw no constitutionally-guaranteed right to be free from annoyances or inconveniences caused by First Amendment practitioners. These are all questions I would like reporters, editorial writers, columnists, radio and television news hosts to pose to our big-city mayors and police chiefs – particularly those in New York, Oakland, Denver, Boston, Chicago, Nashville and Atlanta, among others – where excessive or arbitrary, unprovoked force (including, in some cities, pepper spray, rubber bullets and flash grenades) has been used by police to oust protesters from their encampments or to break up their street marches. And, likewise, reporters could pose these same questions to President Obama, Secretary of State Hillary Clinton (who regularly – if selectively – chastises other countries’ governments for cracking down on their protesters), and Republican and Democratic congressional leaders – particularly those top GOP officials who believe the protesters are merely a dangerous, ignorant “mob” who need to be treated accordingly. And reporters, columnists and other would-be defenders of the First Amendment: Show some outrage about these crackdowns on protest. The goal of many of these mayors and police chiefs is to cow people into submission. (So far, that hasn’t worked, as protesters keep coming back, often in larger numbers, after the arrests.) What happens to a right guaranteed under the Constitution when it isn’t exercised, or isn’t allowed to be exercised because of heavy-handed police tactics? It atrophies. It’s there on paper, but try to exercise it peaceably – and, boy-oh-boy, here comes the pepper spray, the rubber bullets and the mass arrests. But it is precisely these court-imposed strictures that the Occupy Wall Streeters have a problem with. If this interpretation were strictly applied, as some cities are trying to do, then all of the Occupy encampments nationwide can be picked off one by one. The protesters instead take a more absolutist position of the First Amendment’s injunction that “Congress shall make no law...” Since many people have come long distances – particularly to New York for the original Occupy Wall Street protests – and do not have places to stay other than Zuccotti Park, it is clearly a restriction on their rights if they are told they have to leave the park by a certain time every night and could only come back at a certain time in the morning. Apparently at least one federal judge agrees with the protesters, for the time being, at any rate. Earlier this week, Nashville U.S. District Court Judge Aleta A. Trauger issued a temporary order allowing protesters (in the words of a New York Times story) “to be on state property near the Tennessee Capitol at any time of day.” The order came in response to a lawsuit filed by the ACLU that contended the arrests of dozens of protesters occupying Legislative Plaza over a two-day period violated the occupiers’ right to free assembly. A magistrate on both nights had dismissed all of the charges, saying, according to news accounts, he could "find no authority anywhere for anyone to authorize a curfew anywhere on Legislative Plaza." As author and activist David Swanson, who has been camping at Freedom Plaza in D.C., argues, the right to petition the government for a redress of grievances “is under assault,” and must be resisted, otherwise “our rights will come under greater assault everywhere else. We must occupy precisely where we are told we cannot,” while “keeping the conversation focused” on the economic and antiwar issues that motivated the occupations in the first place. This is not by any means a blanket indictment of big-city mayors and police chiefs. In Washington, D.C., where I live, the city’s Metropolitan Police and the U.S. Park Police (which have jurisdiction over Freedom Plaza and McPherson Square, where demonstrators are encamped) have thus far exercised basic hands-off policies even as they keep telling protesters they are in violation of no-camping-or-sleeping-in-the-park regulations. Likewise, as the Associated Press reported, officials in Seattle and Minneapolis, among other cities, have so far not made efforts to evict their Occupy protesters. In Washington, D.C., at least, the fairly consistent media focus on the Occupy D.C. and Stop the Machine encampments and their street actions seems, at least for the time being, to have brought a renewed local emphasis on the constitutional right to peaceably assemble and petition the government. Demonstrators are, for the first time in years, not quietly accepting government-imposed limits on free speech, but are consistently and vigorously challenging what has become an increasingly shrinking right to protest, what with “free-speech zones” and the like. In New York and D.C., the protest signs with free speech messages, such as “The First Amendment Is Our Permit,” bespeak this belief that the Bill of Rights isn’t just a bunch of platitudes that is subservient to city ordinances or federal regulations, or to the whims of police, that diminish the allowable protest areas. For example, there were 19 Stop the Machine demonstrators arrested in mid-October for protesting on the Supreme Court steps while carrying signs denouncing the court’s Citizens United case decision – a decision that opened the floodgates for vast amounts of corporate cash to pour into U.S. elections. (See this video. ) Some of those protesters politely but firmly told arresting officers that the First Amendment trumped any law or regulation prohibiting protest signs on the steps of the Supreme Court, of all places. What, they asked, could be a more basic right than to use a sign to state your grievances at the seat of one of the three branches of government? Charges against the 19, who included Cornel West, the noted Princeton professor, author and activist, were dropped by the government the following day. During the D.C. protests, unlike in New York, Chicago, Boston, Denver, Oakland and some other Occupy cities, federal and local police generally have been extremely tolerant of nonviolent behavior that would have resulted in arrests in the recent past. What would have been almost unthinkable just a few months ago (given past years’ mass, and often arbitrary, arrests of protesters in the nation’s capital) – namely, D.C. Metropolitan Police “escorting” non-permitted marches of hundreds of people through the city’s streets (sometimes at rush hour) – is a reality, at least for the time being. U.S. Park Police tacitly allowing protesters to camp out in Freedom Plaza and McPherson Square – despite a prohibition on tents and overnight sleeping in the parks – is also a reality, for now. In contrast, the New York City police, especially, have come under fire from protesters for the unprovoked use of pepper spray on demonstrators on one occasion and for their tactics in the mass arrests of some 1,000 demonstrators on the Brooklyn Bridge, as well as other arrests involving smaller numbers. Additionally, while New York police have sometimes roughly arrested protesters who engineered demonstrations inside and outside of major banks, police in the District of Columbia have not stepped in and made arrests in similar circumstances. When Stop the Machine activists recently entered a Citibank branch in D.C., they loudly urged people to close their accounts; told customers and employees that Citibank was kicking people out of their homes, and was underpaying regular employees while executives were raking in huge bucks; and that Citibank, along with other big banks, had collapsed the economy. No arrests were made, despite the nonviolent disruption of business as usual. Occupy D.C. and Stop the Machine have also made similar forays to Bank of America branches without any police interference, and in some cases received police escorts through the streets of downtown D.C. Nationwide, well over 2,000 protesters have been arrested since Occupation Wall Street began in mid-September, with almost half of those in New York City. By contrast, including the 19 arrested at the Supreme Court, only a few dozen people have been arrested in the D.C. protests – many of them antiwar protesters connected with Stop the Machine who were arrested by Capitol Police and charged with disrupting congressional hearings or protesting loudly while shutting down two congressional office buildings for brief periods. At various rallies and direct actions, protesters have often been careful to include the police in their remarks as part of the “99%” of the people who are faced with the economic problems and uncertainties caused by the actions of the “1%” on Wall Street and in the corporations. Allegations of police misconduct have been extremely limited to date. Also, perhaps, the police and federal and city officials recognize that this protest is being heavily reported on by the American and international press in the capital city of a U.S. government that often, if selectively, speaks in support of the rights of citizens in other countries to demonstrate against their governments. It would be more than a little hypocritical for the police in the seat of American democracy to storm tent cities and rout and arrest scores of protesters exercising their Constitutional rights. In fact, when organizers of Stop the Machine announced three weeks ago to assembled protesters that the U.S. Park Service was going to extend their permit to occupy Freedom Plaza for four more months, they credited the widespread press attention to the various protests in New York, Washington and elsewhere as likely being an important factor in influencing the Park Service’s decision to let them stay. (As of this writing, though, organizers are warning again that they have been given indications that the Park Service may decide to try to force them out at some point soon.) The McPherson Square encampment has never had a permit, and its presence there – as well as the Freedom Plaza occupation – was reportedly under review by federal and D.C. officials. Outraged over the "fully militarized" and "brutal and vicious" police behavior, particularly Olsen's wounding, some 1,000 protesters successfully reoccupied the plaza on the third day as police kept their distance. 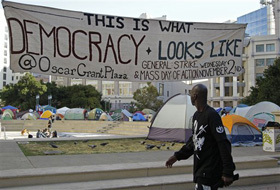 The reoccupation came amid widespread calls for a general citywide strike from Occupy Oakland and many union members. In an effort to defuse the tense situation, Oakland Mayor Jean Quan did a mea culpa and issued what Mark Ash of Reader Supported News called "a rather remarkable statement…[that] marks a watershed for the burgeoning American Occupy movement." Quan announced that there now would be only "a minimal police presence at the plaza for the short term." She pledged better communications with the protesters, expressed concern for demonstrators who were injured by police, and said investigations of "certain incidents are underway and I will personally monitor them." Quan added: "Most of us are part of the 99%, and understand the spirit of the Occupy Wall Street movement. We are committed to honoring their free speech right." But while California news media captured much of this drama, East Coast readers of the Washington Post after the first night of confrontation received only 50-plus words in a summary story under the headline, “Protesters wearing out their welcome nationwide." The article was accompanied by an inexplicable picture of an Oakland police officer patting a cat left behind by protesters – hardly capturing what had just occurred. Post coverage since then has been spotty, while the New York Times has weighed in with at least one strong piece that described the Oakland protesters’ rage over police behavior and their determination not to be evicted from Ogawa Plaza. Given the real possibility of a general strike, East Coast news media should be paying closer attention to Oakland. One conclusion to draw from the extensive coverage of the Occupy movement is that the mainstream media can, in fact, influence public perception and public opinion by what it covers or doesn’t cover, and that in the D.C. case it can possibly affect police treatment of protesters. This is a point that Nieman Watchdog has been making since May in a series of articles (see here, here, and here) on the Afghanistan war and the press. We have repeatedly noted that the mainstream press failure to cover the smaller, but significant antiwar protests that have been occurring over the last couple of years (to say nothing of sizable protests over Wall Street bailouts, unemployment, foreclosures, environmental issues, etc.) gave the impression that people – aside from the Tea Party – were not really that fired up about public issues. Mainstream press coverage of the current protests has allowed a lot of citizens who are not Internet savvy to see that progressive activists are indeed fired up and that they speak for millions of people’s precarious financial situations in voicing their anger and concern over their – and the country’s – future. One other thing seems certain at this point: Regardless of whether the encampments continue around the country until the winter, the energy and organizing underpinning these protests seem unlikely to abate. Already in the weeks to come, a number of events focusing on Wall Street greed and malfeasance have been planned by various organizations that support the Occupy movement. For example, this week (November 3), the 160,000-member National Nurses United (NNU), the AFL-CIO and others will rally in Washington, D.C. to call for a Wall Street financial transaction tax (FTT) with the theme, “make Wall Street pay.” A small fee on transactions, the NNU said, could raise $350 billion annually that could be used to fund pressing human needs. The NNU, which has been the leader in pushing for an FTT, consists of nurses associations from across the country -- including the especially active California Nurses Association, which has continued to lobby vigorously for a Medicare-for-all health insurance plan for the nation. I expect this sort of vomit from people who don't understand constitutional precedent if a book of it hit them in the face, but not from a long time reporter. Not allowing people to camp out on park land overnight isn't clamping down on free speech, any more than saying that protestors shouldn't be able to block major highways. There is no right to protest anywhere and anytime you want. Grow up. And if we are going to raise taxes, which I think we should, most of the money needs to go to shrinking the deficit. Enough with the generation this Hanrahan guy comes from selfishly spendning money they don't have, and passing it onto our kids. Both the loony left and wingnut right are stealing our kids' prosperity by spending money they don't have, or cutting taxes they don't cover in spending cut. You see I actually care about the next generation's future. I know that's foreign to your generation, but I'm more than willing to sacrifice some of my generation's (Gen X) prosperity to pay for YOUR generation's selfishness, so our kids don't have to suffer twice as much when that debt explodes in a couple decades. Mr. Kleinsmith, if only more people had your perceptivity, things would be so much more stable. No more separate countries, no UN, just a Corporate Empire. Dissension is just so reprehensible. We obviously need more prisons, and bringing back poor houses and indentured servitude for credit card debtors might also be a good idea. For the sake of the children. Three cheers for you, Mr. Kleinsmith. Excellent summary of the crux of the strategic battlefield. Thank you Mr. Hanrahan for putting it in clear focus. So if we can protest anywhere we can protest inside the White House, prisons, court houses, military bases and forts? All of those are owned by the people. How long and to what purpose? The Occupy movement, whether or not one considers it a paean to the First Amendment, is meaningless without translation to a political form of action. Peaceful assembly is initially useful in terms of attracting attention to grievances, but at some point, those grievances have to be honed into a something more dynamic and defined than tent cities, plaza sitting and amorphous sloganeering. The continuous occupation of public spaces that Mr. Hanrahan finds so refreshing eventually has logistical issues (think such mundane functions as food and toilets) that become problematic as time passes and seasons change. I am in sympathy with the discontent expressed by the Occupy protesters, but it's time for them to evolve and get serious about finding ways to force actual change - that's the hard part of democracy. Mr. Hanaran, have you been inconvenienced by the protesters? I have. I am an ordinary person, who goes to work, pays my bills and taxes, and supports my family. But for several days I could not do these simple tasks because a wall of people stood in my way, chanting, yelling obscenities, and all but daring me to hit them with my car. The local food market was forced to close; the gas station could not stay open. These are not "corporate devils" but small businesses that cannot afford an unscheduled hiatus. I agree that people have the right to protest anything and everything they wish. But the OWS movement, while it may have had good ideals in the beginning, has morphed into a mishmash of people who (seemingly) just protest anything and everything, claiming their right to disrupt other people's ways of life and businesses. TO me, that is not a peaceful protest. In Oakland, the vandalism that was done was not a peaceful protest. Additionally, the unknown (note unknown) object which struck the veteran was not proven to be a projectile thrown by the police. The protesters were throwing hard objects, such as rocks and bottles, at the police during that melee. It is equally possible he was struck by one of those and his injuries are being used by the radicals of the OWS movement to prove the police are the enemy. Peaceful protesting is a guarantee by the Constitution as is freedom of peace. Where do their rights end and my begin? Why do I not have the right to drive to work, to shop at my favorite store, or fill up at my usual gas station, or even bank at my bank? That is not gaining anything for the "middle class citizen," of which I am one. That is making me angry. By the way, there's always been a ban of camping in public parks and places. Otherwise, there would be year-around encampments in all those places. This is an incredibly honest and detailed article, an opinion piece that does an amazing job of taking the side of the writer. I loved it. a well researched wrap up of many issues that came about up until it's writing.